Climbing photography has many frustrations. Perhaps my biggest is having the light suddenly crap out just as the climber gets into position. 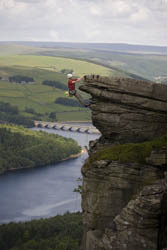 It happened to me again recently on my first visit to Bamford Edge where I could literally see it coming. On this occasion the frustration levels were low. 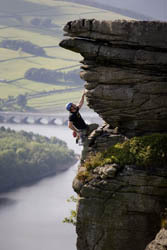 It’s not a hard route, there are always climbers on it, and getting into position to shoot it takes less than a minute. I took a bunch of exposures knowing none of them were as I envisioned so I could look at them later and once again learn some lessons about light. The route is the classic and massively photogenic Gargoyle Flake (VS 4c). 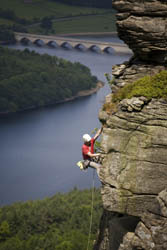 The foreground arete places the climber in a stunning position against the background reservoir and rolling hills below. When we arrived the route was empty and the light gorgeous (first image). I planned to photograph Charles on the route later in the day. In the meantime Justin got on it and I took the opportunity to experiment with positions. As he started up the route the shot looked great. The sun was blazing out of threatening dark cloud cover while a high wind was whipping the patchwork clouds fast across the sky. Justin still looked good (second image). I saw the change coming, saw the cloud gliding to obscure the sun. I practically counted it down from 30 seconds. True to sod’s law, the very moment before Justin started up the final moves the foreground fell into flat shade (third image). Later in the day Charles was queueing on the route and by the time we got started the sun had swung round and was just catching the last edge of the arete, giving it a back-lit effect. The background was lit beautifully (final image). So whilst it was frustrating I didn’t get the shot I had envisioned I’m very pleased with what I was presented. Constantly looking for ways to improve upon images is part of what keeps me going back for more. 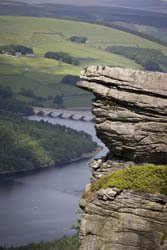 You can view the final processed images from Bamford Edge at Offwidth Images.